A new supercomputer being deployed this month in the U.S. is using solid-state drive storage as an alternative to DRAM and hard drives, which could help speed up internal data transfers. The supercomputer, called Catalyst, will be deployed at Lawrence Livermore National Laboratory in Livermore, California. Built by the U.S. Department of Energy, Cray and Intel, the supercomputer delivers a peak performance of 150 teraflops and will be available for use starting later this month. Catalyst has 281TB of total SSD storage and is a giant computing cluster broken into 324 computing units, called "nodes" by LLNL. Each computing unit has two 12-core Xeon E5-2695v2 processors, totaling 7,776 CPU cores for the supercomputer. Each node has 128GB of DRAM, while 304 nodes have 800GB of solid-state drive storage. Additionally, 12 nodes have 3.2TB of solid-state drive storage for use across computing units. 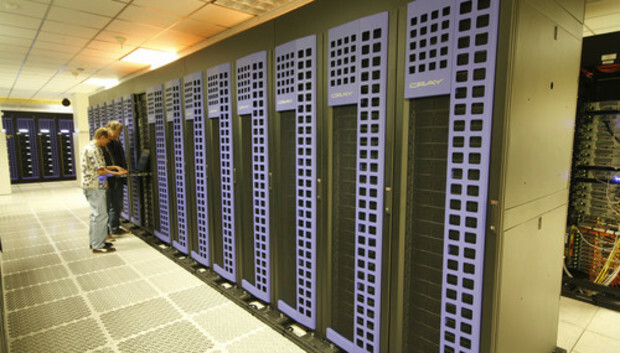 The supercomputer is built around the Lustre file system, which helps break bottlenecks and improves internal throughput in distributed computing systems. The overall performance of the supercomputer is nowhere near that of the world's fastest supercomputer, Tianhe-2, which delivers a peak performance of 54.9 petaflops, but the implementation of solid-state drives as an alternative to both volatile DRAM and hard drives sets Catalyst apart. "As processors get faster with every generation, the bottleneck gets more acute," said Mark Seager, chief technology officer for Technical Computing Group at Intel. The throughput in the supercomputer is 512GB per second, which is equal to that of Sequoia, the third-fastest supercomputer in the world, which is also at LLNL, Seager said. Sequoia delivers peak performance of 20 petaflops. Intel's 910 series SSDs with 800GB of storage are being used in Catalyst. The SSDs are plugged into PCI-Express 2.0 slots, the same used for graphics cards and other high-bandwidth peripherals. Faster solid-state drives are increasingly replacing hard drives in servers to improve data access rates. SSDs are also being used in some servers as cache, or short-term storage, where data is temporarily stored for quicker processing. For instance, Facebook replaced DRAM with flash memory in a prototype server called McDipper, and is also using SSDs for long-term cold storage. Though SSDs are more expensive than hard drives, observers say SSDs are poised for widespread enterprise adoption as they consume less energy and are becoming more reliable. SSDs are also smaller and can provide more storage in fewer servers. Samsung in August announced faster V-NAND flash storage chips that could be 10 times more durable than current flash storage. With faster SSD storage, Catalyst is adept at solving "big data" problems, such as in bioinformatics, analytics and natural language processing, LLNL said in a statement. LLNL has developed a system so memory arrays are mapped directly to DRAM and SSDs, which helps in faster processing of serial applications like gene sequencing. Seager said Catalyst is partly an experiment in new supercomputer designs as the nature of applications and hardware changes.